When cutting operations are performed on the machine, lots of forces are generated. To counter these forces the work and the tool have to be held rigidly so that during cutting operation there should not be any vibration or jerk. The tool is held rigidly in the tool post with the help of bolts. The work is held in the various types of work holding devices like three jaw chuck, four jaw chuck, combination chuck, magnetic chuck, hydraulic chuck, face plate, driving plate, angle plate and lathe carriers. (a) Three Jaw Chuck. 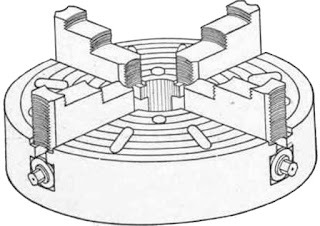 It is also known as three jaw self centering chuck. It consists of a cylindrical body having three jaws fixed radially at its front. Further, it carries a through hole at its centre to enable the long job to project backward in the spindle. It consists of a circular disc having spiral scroll at its front and a rack at its back. The rear face of jaws is provided with slots corresponding to the scroll serrations. The bevel pinions are fitted radially at the back of the disc and they mesh with the rack at its back. Top of these pinions are matching with the outer surface of the chuck and have square slots to accommodate the chuck key. For operating the chuck anyone of these pinion can be rotated by means of the chuck key which, intern, revolves the scroll disc. This causes all the jaws to move in the radial direction simultaneously. Normally two sets of jaws are provided with each chuck, one for gripping on the outside surface & other for inside. 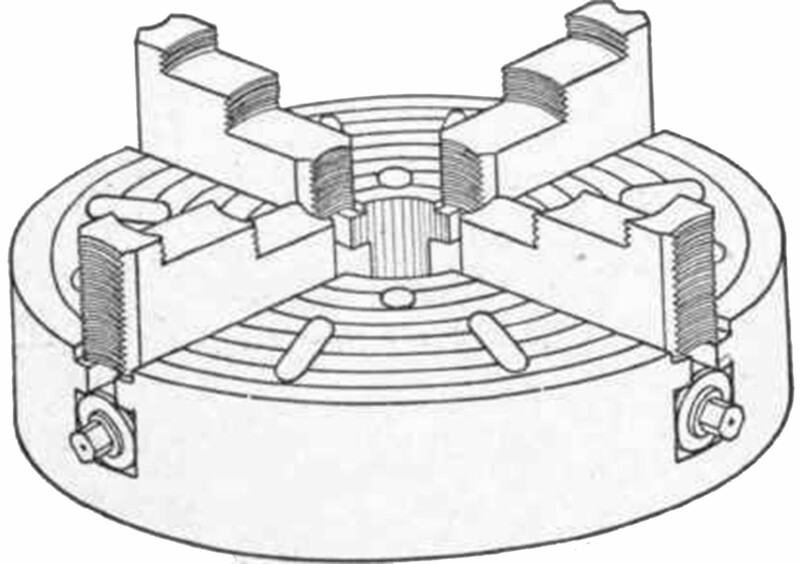 (b) Four Jaw Chuck. In outside appearance, It is very much similar to the three jaw chuck except that it has four jaws, but its internal mechanism differs totally. The rear portion of its jaws is threaded & is engaged with separate adjusting screws. With the result all the jaws can be moved separately and adjusted at desired distance from the centre of the chuck. Due to this it is also known as independent jaw chuck. This enables the chuck to successfully hold irregular or eccentric jobs in addition to the regular cylindrical shaped jobs. It is possible to reverse the same jaws so that the work can be gripped from inside surfaces also. Body. It is made of cast iron. There is a provision in the body for keeping the magnetic plates. 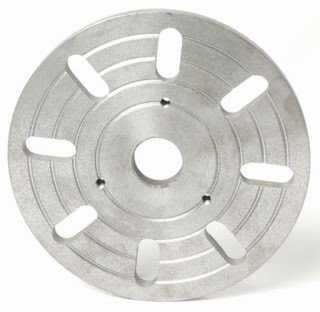 The body of the round chuck is connected with a back plate, which is threaded to be screwed on the nose of the spindle. Base. It is also made of cast iron. In rectangular chuck the base is used for mounting on the table. In round chuck the base plate is used for mounting on the lathe spindle. Magnetic Plates. These are magnetic plates of high strength, which are kept in the body. Non-Ferrous Metal Plate. A non-ferrous metal plate such as brass or aluminium is kept around the magnetic plates. This plate does not allow having any magnetic effect in the body of chuck. Lever or Handle. 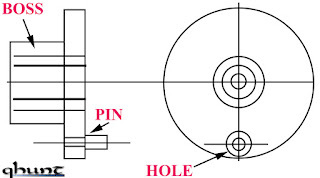 A lever is provided in the chuck, which converts the magnetic field, and the magnet is "on". (ii) Electro Magnetic Chucks. These are also called temporary captivating chucks. 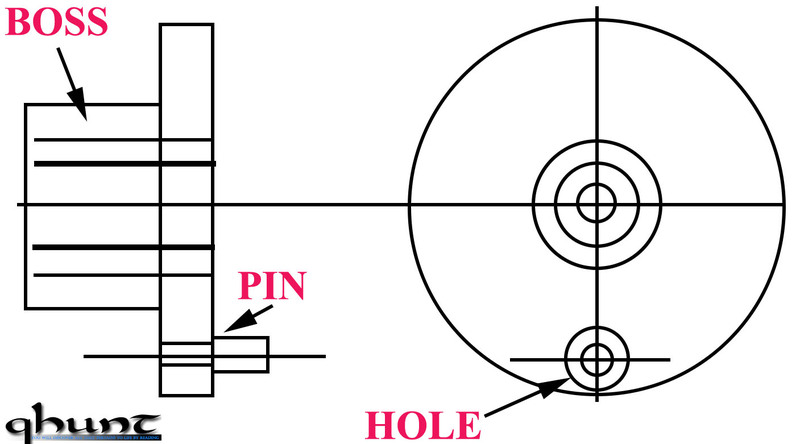 It implies the use of electric current for developing a strong electromagnet, which holds the job centrally in chuck. Light works should be clamped on magnetic chucks. When the job is to be machined on lathe, the speed and feed should be kept low. Small packing should be provided around the work. The surface of the job and the chuck should be properly cleaned from oil etc. (d) Combination Chuck. As the name implies, a combination chuck may be used as a self centering or as an independent chuck to take the advantages of both types. The jaws may be operated individually by separate screws or simultaneously by the scroll disc. The screws mounted on the frame have teeth cut on its underside which messes with the scroll and all the jaws together with the screws move radially when the scroll is made to rotate by a pinion. It is usually a circular cast iron disc having threaded hole at its centre so that it can be screw to the threaded nose of the spindle. 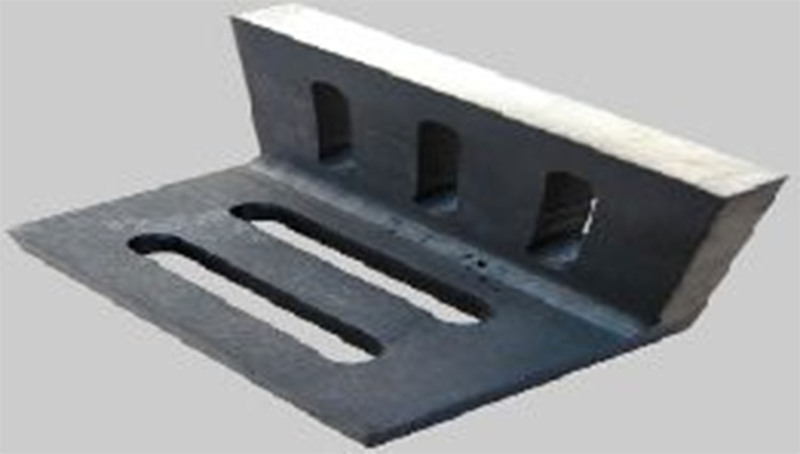 It consists of number of holes and slots by means of which the work can be secured. It is a cast circular disk having a projected boss at its rear. The boss carries internal threads so that it can be screwed on spindle nose. It also carries a hole to accommodate a pin which engages with the tail of a lathe dog or carriers. It is employed for holding odd shape work in conjunction with a faceplate. When the shape of the work is such that it is not possible to mount it directly on the face plate it can be mounted on angle plate.